Closed: Fixed None Opened 6 years ago by pravins. 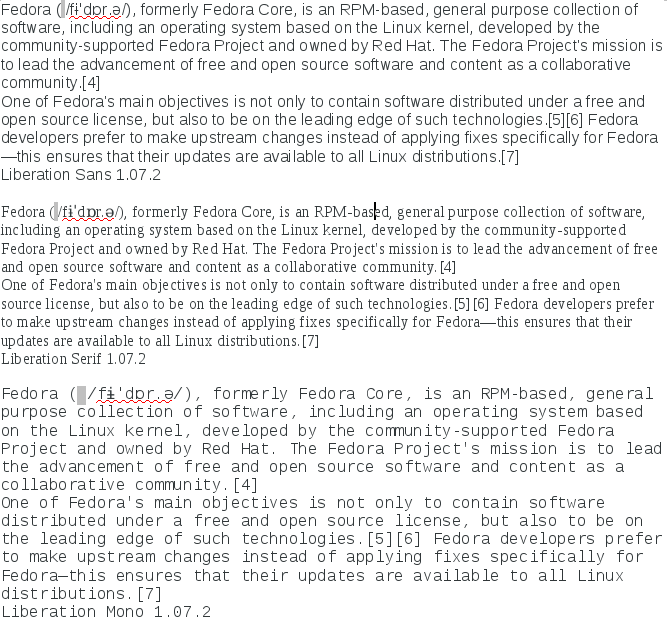 Liberation Fonts 2.0 is one of the feature of Fedora 18. It provides more coverage, better licensing and improved hinting over Liberation 1.07.2 release. Recent bugs like Fuzzy font rendering (https://bugzilla.redhat.com/show_bug.cgi?id=856239) has created some doubts but detail testing of same provided some positive results about this feature. 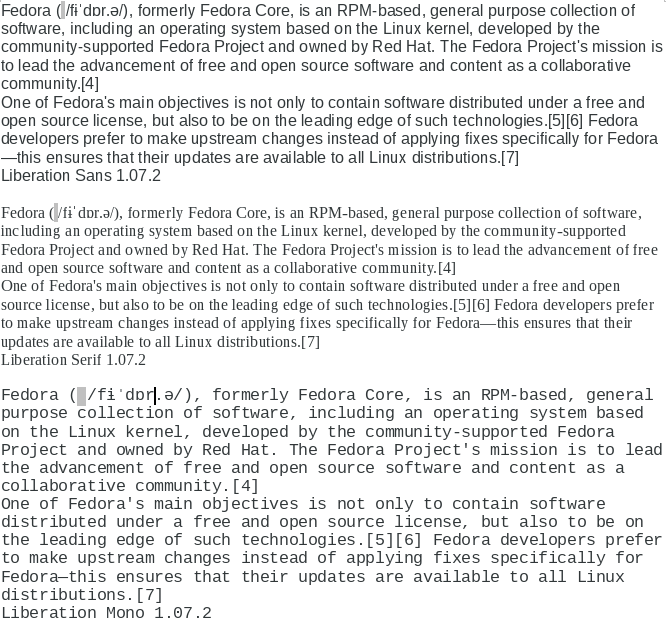 1. https://bugzilla.redhat.com/attachment.cgi?id=623366 "Right hand side is Liberation 2.00.1 and Left hand side Liberation 1.07.2"
Take a feedback from members regarding, readability of New liberation over old. Comparison of hinting with old and new liberation. Pravin, please update the status. if you don't need to discuss about this issue in the meeting anymore, close this ticket, please. Realistically at least we need to fix 2 and 3. For blurred rendering, possibly what we can take an action is to check google-croscore-fonts if it's same rendering, and ask the bug reporters how it looks. if they think it's same, it can be a new feature perhaps or better think about it as a separate issue for future improvement. otherwise it would means it was introduced after forking. Pravin, if I'm missing anything else or something wrong, please correct and update the ticket or bugzilla with certain actions. Yes you are right. Those are the open issues. I have to do some more analysis on 2, 3 issues. If those are there i will definitely fix them. In next couple of days, i will add some more testing screenshots against the query raised regarding hinting. Apologies for delay from my side. One more bug on same thing. Please note: if we are going to take the contingency plan, we need to request some updates on rel-notes through Bugzilla since we have some words for this feature. Please close the ticket once your action item has been done. thanks. confirmed the release notes doesn't contain liberation fonts thing. closing this ticket now.